President Edgar Lungu has threatened to close the Copperbelt University and the University of Zambia if students at the two institutions continue rioting and causing damage to public property. President Lungu wondered why students at the two public universities are the only ones always rioting and damaging public and private property. He said that it was unjustified for students to come from their respective homes only to destroy public and institutional property. President Lungu noted that his administration will now have to put its foot down even it means closing down the two public universities. President Lungu was responding to Journalists in Kitwe shortly after touring the Zambia Institute of Business Studies and Industrial Practice -ZIBSIP Hostels which have been renovated at a cost of 1.7 Million Kwacha. He said that he was willing to meet students’ representatives but changed his mind after seeing the trail of damage to public property caused by rioting students. And President Lungu has assured the public that whistle blowers with information on corrupt activities should come forward because they are safe and protected. President Lungu said that the 1.7 Million Kwacha spent to renovate hostels at ZIBSIP by the Zambia National Service-ZNS could have cost more if commercial contractors were engaged to do the job. And President Lungu has urged politicians to stay away from institutions of higher learning and other similar facilities, to enable them run smoothly. 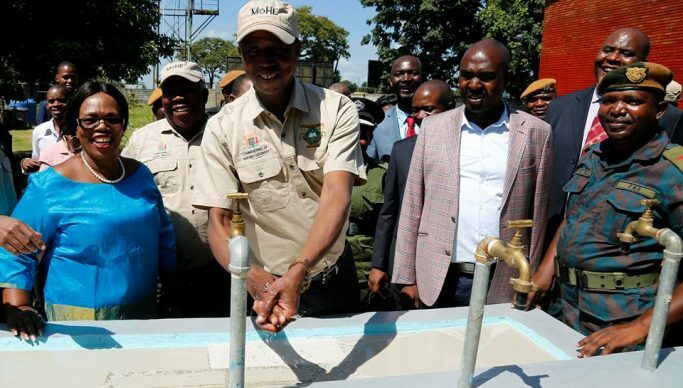 And President Lungu said that he is impressed with the quality of rehabilitation works done by the Zambia National Service ZNS in the country. Meanwhile, Minister of Higher Education Professor Nkandu Luo, assured the president that the rehabilitated infrastructure will be taken care of to avoid vandalism.